Vamvakas Sotirios graduated from the Dental School of Athens in 1986 and function in the private sector for 20 consecutive years. He worked in private dental office for 10 years in the city of Athens with great employment subject to the oral surgery (removal of inclusion cysts, prosthetic surgery etc) after the oral surgery retraining. 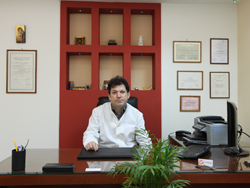 Since 2000 he works in his private surgery in the city of Kalamata. In 2009 he began a postgraduate program in implants in the [ITI] World Institute of Implants in Switzerland and completed this program successfully in 2010. The year 2011 was educated at the City University of Seattle, at the most advanced system and use of growth factors and steem cells in Implantology as well in construction engineering installation IPG implants in minimum bone atraumatic in sinus floor with simultaneous closed lifting. Head of dermatology section : Vamvaka Efstathia. She gratuated from the Medical School of Athens and acquired the specialty of Dermatology - Venereology at the hospital Andreas Siggros.